Last Friday, I suggested five reasons why a person might want to write a blog. Did any of my readers rush out and start a blog? Please let me know if you did and “congratulations.” Blogging is not for everyone and I’ve even had people tell me “THE PERSONAL BLOG IS DEAD.” That may very well be true. If this is the case and the collapse of blogging is imminent, I have worked out a backup plan. Follow me on Twitter @auntomato. If you’re not on Twitter, my brother Jim Baumer tells you how to do it in five easy steps. For those who think the personal blog is dead, it’s still the wee small hours of the morning; the blogging hour for me. As I take a slow glance about the internet, I see the blogosphere still chugging along, not dead yet. The pending collapse of blogging may discourage some of the people who were hiding in the trees along the riverbank, hesitantly planning to jump into the word fray. There are many ugly trees that are dropped into office parking lots across this land; maybe some bloggers are hiding under them as well. One thing is sure. 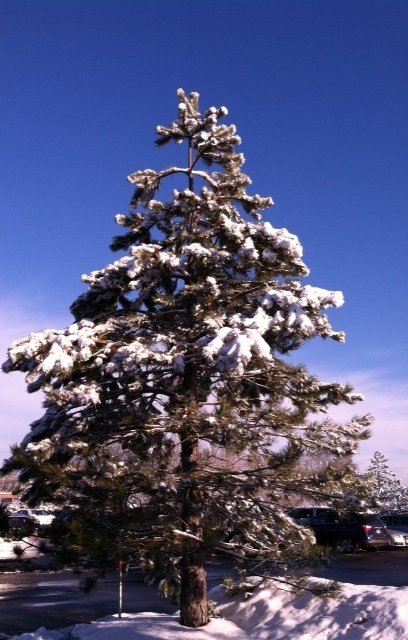 Even an ugly tree looks beautiful after it snows. For those tentative tree hiders who might still think blogging is beautiful, I present today’s bloggernot. Join me in twelve reasons not to start a blog. You see no need to change yourself. Facebook stalkers who never post status updates are probably not in the blogging business. Writing a blog takes time, energy and passion. Even if a person is a content-creating maniac, an idea has to go from the brain to the medium; the transmission involves a pencil, a computer, or some other communication and transcription device. There is still no Jean-Luc Picard method of blogging. When you start putting your “work” out on the highway of ideas, everyone will have an opinion about your stuff. They may tell you about it. They may not. As sure as I’m writing this, someone who has never written 500 words at one sitting will tell me how to make my blog better. They might suggest advertising, more pictures, and hot air balloons. For a sensitive person, these suggestions are tempting and will distract you from the task at hand. Writing a blog with any frequency involves much more than writing a few hundred words. After you’ve written your content, it must be edited, proofread, and entered into a blogging tool. There are graphical design decisions to be made and if photographs are included with a post, there might be some additional work. More editing is done before publishing to the web. After a while, it’s like driving a car and maybe you can do it without thinking, but it can take some time to develop confidence about the decisions. A person who doesn’t like making decisions will not like blogging. Unless you have an excellent and unique product that the market wants, you will make no money on a blog. You might even spend some money purchasing your own domain name and personalizing your blog. It might look like blogging is just a lucky day at the casino, but it’s not. Analyze your life. How many times have you joined the gym on January 2nd and made it until January 10th? How many times have you said “I’ll never smoke another cigarette” and then scrounged around in your freezer for your emergency pack? Sworn off Doritos? Do you have a spare bedroom full of unfinished craft projects? Is your garage filled with plastic containers of things that need to go to the local thrift shop? If any of these questions ring a quiet bell in your ear, blogging is not for you. Bloggernot; it’s up to you. This entry was posted in Friday Pillow Talk and tagged blogging, Jean-Luc Picard, Jim Baumer, Mark Baumer, reblogging, SEO, spam, Twitter. Bookmark the permalink. One of my friends said maybe I was a little “harsh.” The truth is, a blog can be anything you want it to be. If I can inspire a person or two to explore their creativity, it would make me happy!